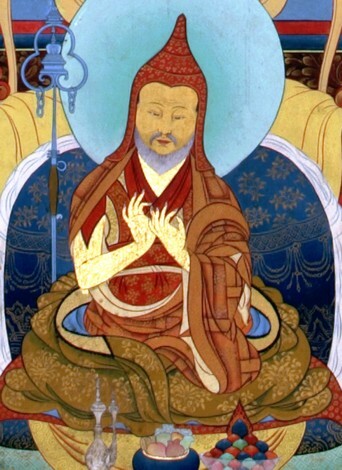 Gyalsé Shenpen Tayé was an incarnation of Minling Terchen Gyurme Dorje (1646-1714). He followed many great Sarma and Nyingma masters of the Rimé movement, especially the first Dodrupchen Rinpoche Changchup Dorjé (aka Jikmé Trinlé Özer) (1745-1821), Jikmé Gyalwé Nyugu (1765-1843), the Fourth Dzogchen Rinpoche Mingyur Namkhé Dorjé (1793–1870), Sengtruk Pema Tashi, Minling Trichen and Minling Khen Rinpoche. In this way, he eliminated all doubts and misunderstanding through listening and reflection. By practising in many of the sacred places from the snowy upper regions of Mount Kailash down to Mount Langchen Gying Ri in China, he became a master unrivaled in his learning and accomplishment (Khedrup Chenpo). According to the prophecies of his lama Dodrupchen Rinpoche, he went to stay at the monastery of the Palgyi Sengé mountain where he upheld and spread the Dharma in both its aspects of transmission and realisation. He produced many students who devoted themselves completely to his lineage, such as Khenchen Pema Damchö Özer (aka Khenpo Pema Vajra). After the death of the First Dodrupchen Rinpoche, he served as the regent of Dodrupchen Monastery for some years. Here he started the tradition of an annual 45-day practice of the Guhyagarbha Tantra. Patrul Rinpoche was his assistant in this for the first year and then officiated himself for the next two years. In 1842 he took over responsibility for Dzogchen Monastery after it had been almost totally destroyed in an earthquake. He entirely rebuilt the monastery and also established a new college of philosophical studies, the Shri Singha shedra. Due to his efforts, this rapidly became one of the most important centres for Nyingma studies. Many of the greatest 19th-century Nyingma scholars and yogins, including both Mipham Rinpoche and Patrul Rinpoche, studied and taught there for many years. He established a particularly pure and meticulous observance of vinaya discipline at Dzogchen monastery. This included the tradition of annual ‘rainy season’ retreats, as in the time of the Buddha. This custom was subsequently followed by many other Nyingma monasteries. At the injunction of Minling Trichen Sangyé Kunga and Petrul Pema Wangyal, he gathered the activity practices of the Nyingma Kama into a few volumes that he had published. He then initiated the annual practice at Dzogchen of all the rituals, ceremonies and sacred dances of the 13 kama sadhana-cycles. Again, this tradition was later taken up by many other Nyingma monasteries. His collected works include a commentary on the Guhyagarbha Tantra entitled The Heart Essence of Samantabhadra (ཀུན་བཟང་ཐུགས་ཀྱི་ཏི་ཀ་, kun bzang thugs kyi ti ka). His personal students included Jikmé Gyalwé Nyugu and all three incarnations of Jikmé Lingpa—Patrul Rinpoche, Do Khyentse Yeshe Dorje and Jamyang Khyentse Wangpo—as well as Shechen Öntrul Thutob Namgyal, Minling Trichen Sangye Kunga and the great Dzogchen Khenpo Pema Dorje. ↑ Biography based on Khetsun Zangpo Rinpoche's Biographical Dictionary of Tibet and other sources. ↑ Most probably the Sixth Minling Trichen, Gyurme Pema Wangyal, according to dates of birth and death, and to the fact that Gyalsé Shenpen Tayé was a teacher of the Seventh Minling Trichen, Gyurme Sangye Kunga. ↑ Most probably the Seventh Minling Trichen's younger brother, holder of the Khen Rab lineage. ↑ He thus became known as the First Dzogchen Gemang Rinpoche. This page was last edited on 4 February 2017, at 19:24.